I am putting in a movie now... so will get one watched today. I will use this thread tomorrow. I will use this thread IF I get the chance to watch something on Thursday. I will use this thread on my day off on Friday... and that will be the completion of this marathon. Gary Oldman, Winona Ryder and Academy Award® winner Anthony Hopkins (1991 Best Actor in a Leading Role, The Silence of the Lambs) star in Oscar® winning director Francis Ford Coppola's (1974 Best Director, The Godfather: Part II) visually stunning, passionately seductive version of the classic Dracula legend. In BRAM STOKER'S DRACULA, Coppola returns to the original source of the Dracula myth, and from that gothic romance, he creates a modern masterpiece. Gary Oldman's metamorphosis as Dracula – who grows from old to young, from man to beast – is nothing short of amazing. Winona Ryder brings equal intensity to the role of a young beauty who becomes the object of Dracula's devastating desire. Anthony Hopkins co-stars as the famed doctor who dares to believe in Dracula, and then dares to confront him. Opulent, dazzling and utterly irresistible, this is Dracula as you've never seen him. 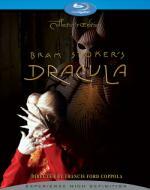 And once you've seen BRAM STOKER'S DRACULA, you'll never forget it. One of my favorite tellings of the story. I really do enjoy this film a lot... though I tend to go a long time in between viewings. Probably due to the length of the film itself. Being up over 2 hours I need to get myself in the mood for a movie of that length. I do find this one to be slow at times... but I think that is to be expected in a film as story driven as this one. But I think most everyone did a good job in this movie. Definitely worth the time put in to watch it. Highly recommended. I saw The Lone Ranger in the theater...on opening day. I really enjoyed it. I got the Blu-ray for Christmas. I haven't watched it again yet. I need to get to that. And a bunch of other movies....and write about more stuff again. I need more time in the day. 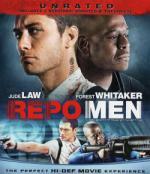 Remy (Jude Law) and Jake (Forest Whitaker) are best friends and The Union's most dangerous repossession men, reclaiming top-dollar organs when recipients fall behind on their payments. But after an on-the-job accident forces Remy to be outfitted with a top-of-the-line heart replacement, he finds himself in debt and unable to pay. Now, the hunter becomes the hunted as Jake will stop at nothing to track him down to finish the job. What do I think of this one? Hmmmm... ever watch a movie and afterwards not really know what you thought of it? Well that is how this one is for me. Not great... but not bad either. The problem is I can't pinpoint what I liked and what I didn't like about this film. But as a whole I found it to be an entertaining waste of time. But I don't see myself going back to this one all that often. 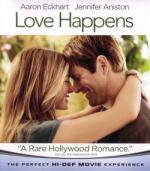 Jennifer Aniston and Aaron Eckhart star in the romantic drama Love Happens. When self-help author Dr. Burke Ryan (Eckhart) arrives in Seattle to teach a sold-out seminar, he unexpectedly meets florist Eloise Chandler (Aniston), the one person who might be able to help him help himself. But will two people who may have met the right person at exactly the wrong time be able to give love a chance? If they can, they'll find that sometimes, when you at least expect it... love happens. I got this film mainly because of Jennifer Aniston... as I been a fan since Friends (a show I been getting the urge to watch lately). Never heard of the film before getting it. I found it to be ok...but far from a great Rom-Com. Mainly because they just couldn't get me to care about the characters. This is not one to worry about missing. If you can watch it cheap or free... well then why not.... but nothing worth searching for. Arthur Poppington (2009 Academy Award® Nominee Woody Harrelson - Best Supporting Actor, The Messenger) doesn’t need superpowers or fancy toys to fight crime. Armed only with a childlike sense of wonder and his quirky arsenal of cheap, homemade gadgets, he becomes DEFENDOR! He finds an unexpected partner when he rescues and falls for a local prostitute (Kat Dennings, Nick and Norah’s Infinite Playlist). Can the two of them take down the city’s most fearsome crime boss without getting killed in the process? This is a film I enjoyed very much.... even though going by the trailer I wasn't sure I would. When I first saw the trailer I thought it would either be very good or very bad. I am happy it turned out to be very good. I have always liked Woody Harrelson... and I am also fans of Kat Dennings and Sandra Oh. Definitely recommend this one... well worth the time put in to watch it. With only 6 films watched.... being called into work 2 of my 3 days off... I would have to call this marathon an epic fail. Now I do not go into work until tomorrow evening (6pm til 12:30am). Then I am scheduled off on Monday and Tuesday. So I am going to attempt this one more time over the next three days. I am also adding more titles to the list in the first post here shortly if you would like to look the first post over again and make any suggestions for the next attempt. These are ones I either just got or missed the fact that they were on my shelf. Feel free to give me suggestions on what to watch... but I can't promise I will get to the suggested film... depending on time I have and the mood I am in. If I am not in the mood for a certain type of film I will not enjoy it nearly as much at the time... which wouldn't be fair on the reviews I write or to the person that suggested the film. Wealthy Helena Phillips Evans (Mary Eldredge) mysteriously vanishes just as she is about to donate $250,000 to her alma mater, the exact same school where teenage sleuth Nancy Drew (Bonita Granville) just happens to currently attend. With the help of her lawyer father Carson Drew (John Litel) and her pseudo-boyfriend Ted Nickerson (Frankie Thomas), determined Nancy vows to track down the missing Ms. Evans. I had a little time so went ahead and popped this one in. 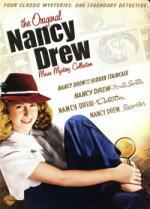 It is part of a 4 movie set called The Orignal Nancy Drew Movie Mystery Collection. The first thing I did was watch the trailer... which worried me as the quality of the trailer was terrible. Didn't look like t was cleaned up at all. Thankfully you could easily tell they did on the film itself. Though there was still a few minor problems with the film. Mostly just pausing for a second or two here and there. The film itself was right good. I definitely enjoyed it. I thought Bonita Granville was right good in the title role. Even if I am more used to the '70s version of Nancy Drew. The storyline kept my interest from beginning to end. Now I just have to watch the other 3 film in the series. Recommend checking it out for an entertaining classic film. 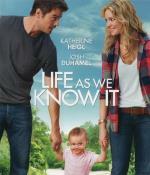 Holly (Katherine Heigl) is an up and coming caterer and Messer (Josh Duhamel) is a promising network sports director. After a disasterous first date, all they have in common is their dislike for each other and their love for their goddaughter Sophie. But when they suddenly become all Sophie has in this world, Holly and Messer must set their differences aside. Juggling career ambitions and competing social calendars, they'll have to find common ground whle living under the same roof. Josh Lucas, Hayes MacArthur and Jean Smart costar in this tart and tender romantic comedy directed by Greg Berlanti (TV's Brothers & Sisters and Everwood). I have seen this one a couple times before... but finally got my own copy of it. I really enjoyed this one quite a bit. I found the storyline to be entertaining... and thought everyone in it did a good job. I got this one mainly because I am a fan of Katherine Heigl, I really liked her in both Roswell and Grey's Anatomy. I got my copy on Blu-ray... and I must say I find it odd for a Blu-ray of such a recent film that there is so little when it comes to extras. This disc only has deleted scenes for an extra. Yes... I collect the discs for the film itself... but still that is a little aggravating. But this film is still worth the time you put in to watch it. If you never seen this one before I recommend checking it out. It's the movie that single-handedly brought back old-school American horror...then drove a hatchet straight into its shocked and screaming face. Now the blood-sprayed saga of a group of tourists, their bayou tour, and the legend of deformed swamp psycho Victor Crowley returns wetter, redder and better than ever before! Joel David Moore (Avatar), Deon Richmond (Scream 3), Tamara Feldman ("Gossip Girl") and Mercedes McNab ("Angel") star – along with horror icons Kane "Jason" Hodder, Robert "Freddy Kruger" Englund, and Tony "Candyman" Todd – in this limb-tearing, skull-splitting, and gut-ripping Director's Cut featuring a new HD transfer. 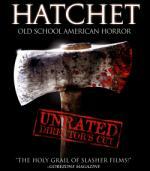 The HATCHET Army marches on: Victor Crowley is totally uncensored, completely unrated and forever unstoppable on Blu-ray™! This one is a decent movie... but not the best horror I ever seen. You can't take it too seriously. Unfortunately the horror icons only had single scene parts (besides Kane Hodder who played Victor Crowely). But it was cool to see Mercedes McNab (Harmony on Buffy) through-out the movie. She played a dumb blonde in this one as well. Over-all.... an enjoyable film but don't expect to much... this one is heavy on gore but light on scares. Worth the time it takes to watch it. But I would recommend making sure you get this one as cheap as possible. You only live once, so why not go out in style? 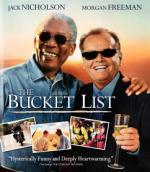 That's what two cancer-ward roommates, an irascible billionaire (Jack Nicholson) and a scholarly mechanic (Morgan Freeman), decide when they get the bad news. They compose a bucket list – things to do before you kick the bucket – and head off for the around-the-world adventure of their lives. Sky-dive? Check. Power a Shelby Mustang around a racetrack? Check. Gaze at the Great Pyramid of Khufu? Check. Discover the joy in their lives before it's too late? Check! Under the nimble direction of Rob Reiner, the two great stars provide the heart and soul, wit and wiles of this inspired salute to life that proves that the best time of all is right now. This film is a weird one in my mind. It is one I wanted to upgrade to the Blu-ray... even though it isn't one of the best films I ever seen. I really don't know why I had the urge to upgrade it... but I did. I guess it has something to do with the fact that I am a fan of both Jack Nicholson and Morgan Freeman. The film itself is a good one. It is entertaining... but I was somehow expecting a bit more from it. It is definitely worth the time put in to watch it. But it is definitely one of those cases where all the best parts of the movie was in the trailer. Just when you thought it was safe to go to sleep, Freddy Krueger (Robert Englund) is back to haunt your dreams and freeze your blood! Lisa Zane (Bad Influence) is a child psychologist tormented by recurring nightmares. But not until she meets a new patient with the same horrific dreams does her quest for answers lead to a certain house on Elm Street-where an evil that defies the grave is about to be unleashed upon the world. With Yaphet Kotto (TV's Homicide, Alien) and cameos by Rosanne, Tom Arnold, Alice Cooper and Johnny Depp, this chapter in the world's most terrifying dream saga is a fantastic voyage. This one... while still a good one... probably has the most comedic elements of all the "Nightmare" movies. It tells the reason why Freddy first started going after the children... which I think they fit in rather well. Surprisingly this Blu-ray set only has the 2D version of the film. Not that it matters since being blind in 1 eye I can't watch films in 3D anyway. Not my favorite of the franchise... but not my least favorite either. Worth the time put in to watch it.